We find ourselves living in a time where demagoguery, tribalism, xenophobia, and racist, classist policy seem to be gaining ground across the world. How can we cope with the fear, anger, despair and helplessness we feel whenever we read the news? We know that Focusing can help us move from paralysis to action through embodied awareness. Focusing can also facilitate embodied connection with ancestors, who can listen to our distress, care for us when we’re depleted, comfort us when we feel hopeless and guide us when we need a way forward. Our ancestors can offer a wider perspective that comes from their own lived experience, and from having watched human history over time. Whether they were oppressors, the oppressed, or a mixture of both, their legacy can fuel us to challenge oppressive systems, within and without. When we work with ancestors using Focusing, our anger and heartbreak can be transformed into resolve and resilience to be the change we wish to see in the world. Beilah Ross, LICSW, has been practicing Clinical Social Work for over 20 years, has been Focusing since 2006, and gained certification as a Focusing-Oriented therapist in 2009. She works in private practice with adults, couples and children, using Focusing and other experiential modalities to help her clients connect with body-centered wisdom. She teaches Focusing to individuals and groups through community workshops. She has led workshops on healing inter-generational trauma using FOT, accessing ancestral wisdom with Focusing and is interested in running future workshops on how Focusing can support anti-racist action. In this workshop, we will explore how, as parents and grandparents, we can enhance our capacity to be more attuned to our children and ourselves in mindful, fresh, and creative ways. We will discuss how reflective listening, curiosity and non-judgmental attitudes can nurture our relationships with our children. Through case examples and experiential exercises, we will apply the principals of Focusing (a mindful practice) to our relationships with ourselves as parents as a way to enrich our capacity to be present to the children in our lives. Kelley Bothe, LICSW, FOT, is a psychotherapist practicing in Wellesley and Concord, MA. Kelley sees adults in individual therapy and also runs divorce support groups bringing the mindful practice of Focusing into her work. Julie Ramsey, LICSW, FOT, is a psychotherapist in private practice in Wellesley, MA. She works with adolescents and adults in individual and couples therapy. - You will gain practice in staying with the focusing process and felt-sensing. Cost is $180 for the series. In this workshop, we will explore how, as parents and grandparents, we can enhance our capacity to be more attuned to our children and ourselves in mindful, fresh, and creative ways. Using focusing principles we will discuss how reflective listening, curiosity and non-judgmental attitudes can nurture our relationships with our children. We will explore ways to help children connect with themselves and expand their ability to understand their feelings more deeply. Through case examples and experiential exercises, we will apply the principals of Focusing to our relationships with the children in our lives. Julie Ramsey, LICSW, Certified Focusing-Oriented Therapist, is a psychotherapist in private practice in Wellesley, MA. She works with adolescents and their families and adults in individual and couples therapy. Kelley Bothe, LICSW, is a psychotherapist in Wellesley and Concord. 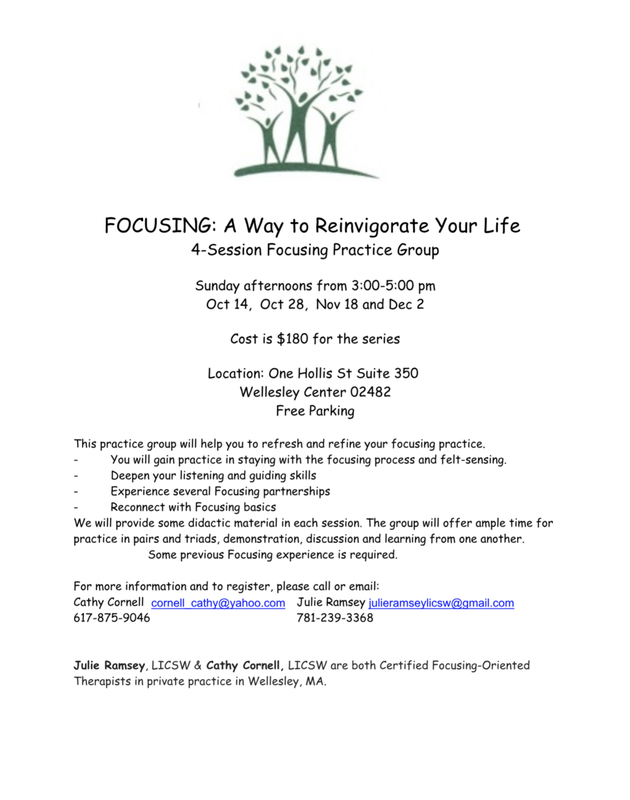 Kelley is a Certified Focusing Trainer and enjoys teaching classes for beginning and experienced Focusers. The workshop is for those new to Focusing as well as those who have some experience and want more practice. Positive Psychology is not about putting a happy face that covers over our important life struggles. It is about balancing suffering by amplifying our authentic well-being. It is an evidenced-based approach for increasing our capacity (or our clients’ capacity) for flourishing, and for fully appreciating our lives. People who have a higher ratio of “positivity” to “negativity” have more energy and better health. In the workshop, we will use Focusing to review several forms of positivity, such as joy, gratitude, serenity, hope, awe and love and to personally explore a few different pillars of Joy, as defined by the Dalai Lama and Desmond Tutu. Then we will reflect on positive defining moments in our lives that have elevated us or brought us greater connection. We will end by exploring how to have more of these transformative moments. This will be a new workshop covering different material than the previous one. Joan Klagsbrun, Ph.D., a psychotherapist in private practice, has been teaching Focusing internationally to psychotherapists, educators, healthcare providers and the public for over three decades on seven continents. Her current passion is crossing Focusing with creative expression and positive psychology. As human beings, we all have the unique capacity to be creative in whatever form we choose. When accessing our creative potential, we reawaken a sense of playfulness and purpose, which frequently brings more vitality to our life. And sometimes the immense joy and sense of satisfaction that is experienced when creating are among the precious gems of life. At times, however, many of us find it difficult to tap into our innate creative abilities because of our fears, our inner critics, or our lack of confidence. In this workshop, participants will be guided through Focusing and a series of creative experiences to find a pathway into their inner creativity. Focusing is a mindfulness practice that helps to reveal our internal experience of the events in our lives. By using a Focusing approach, we can tap into our inner resources and get a sense of what we are experiencing and how we might want to express it. No experience or artistic abilities are necessary. Judith Stein, PhD, is a licensed psychologist and a Focusing-oriented psychotherapist, who has a private practice in Lexington, Massachusetts. She is also trained in Mindfulness-Based therapeutic approaches and has been teaching and practicing mindfulness in the Boston area for many years. As a therapist, she relies on her mindfulness practice and focusing orientation as a foundation for her work with others. Sophie Glikson is a certified Focusing and Expressive Arts Therapist, and a Licensed Mental Health Counselor in the sate of Massachusetts. She offers coaching, psychotherapy and supervision in person in her Creative Pathways practice studio located in Medford, MA., or through online communication if applicable. To address clients’ aspirations, goals, strengths and concerns, she applies the wisdom of the heart, the principles of Mindfulness and Focusing, and the power of imagination.